From the year 1873 to 1879 we were a harmonious and model community, living in peace and good fellowship, with no offensive inequalities of fortune or education. Upper and Lower Valley, East End and West End mingled on equal footing at our picnics, May Day parties, and Christmas trees. Our population continued increasing, and the newcomers were welcomed to our festivities. Those were happy days for our children who knew no strifes but a generous emulation at school; many of them are now fathers and mothers residing in the valley, some have left to return, and a few have gone never to visit us again. 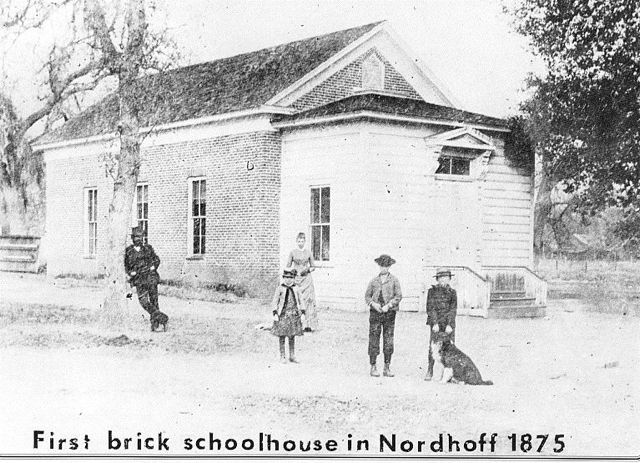 The brick schoolhouse served as Nordhoff's church until 1882. Our little brick school house sheltered on Sundays members of all churches and creed, and many were ignorant and indifferent as to the pastor’s sect or denomination, enough that he preached good will and the golden rule to all men. The stentorian voice of our village blacksmith led the choir at service, and, admitting that he did sing out of tune a half note on either side of the scale was a trifle in those days to the neighborly ear of charity, and was compensated by the fervor of his good intentions. For years we were content to ride in our farm and spring wagons, and our cottage organs were the pride of the parlor and had the choice location among the furniture. But this Arcadian felicity was not to last forever, and the demon of discord was biding his time to entrap us. First, a top buggy came into the Valley and the wagon fell fifty points. Then Mrs. _____ introduced with her two accomplished daughters, a seven octave Steinway grand, and the organ trade disorganized to a collapse. Later, a reading club was got up in the village, having a clause to avoid crowding, that members must reside in Nordhoff. This was equal to slamming the door in people’s faces, and the epithets “stuck up” and “high-toned,” were hurled back in retributive ejaculations. The fact is, people were soured. The year 1877 was a dry one, and 1875 was the disastrous “rust” year, and two bad years in succession made people “long” on expense and “short” on resources. The hotels were crowded with stylish eastern tourists who introduced new and expensive notions, sneered at our music and church service, and reproached us on our want of a decent church. The two hotels, though miles apart, glared at each other in envious rivalry. 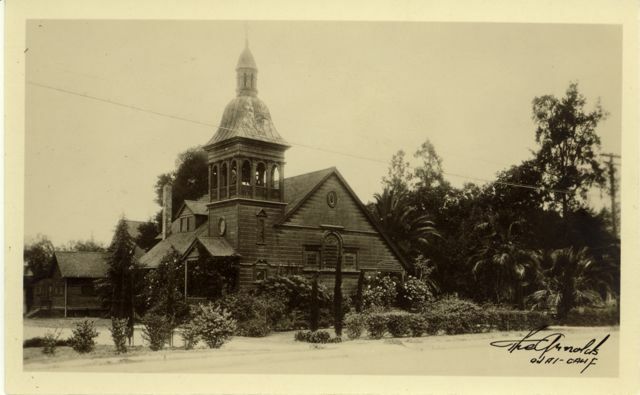 [The Nordhoff Hotel was located where the Libbey fountain is now; Oak Glen Cottages were located on the corner of Ojai Avenue and Gridley.] The guests and others at the Nordhoff Hotel raised a subscription to build a church, and the whole Valley joined in the contribution; trustees were chosen and the association incorporated, and all went harmoniously till the question of the church site came up. Then the storm burst. 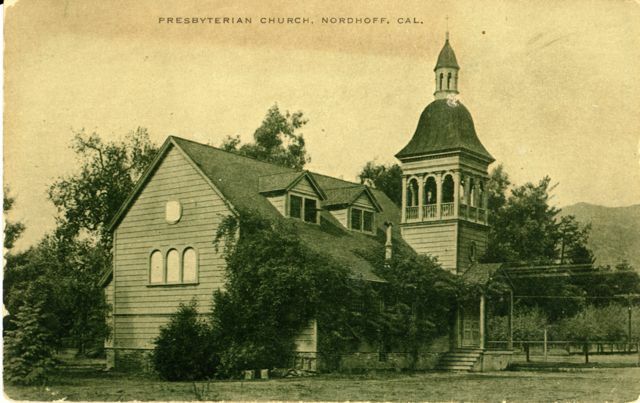 Nordhoff people insisted on having the church in their town, while the outsiders were equally determined to have it up their way, and complete rupture took place between Nordhoff and its opponents; and the village, strong in the justice of its course, put on its war trappings and defied the world. 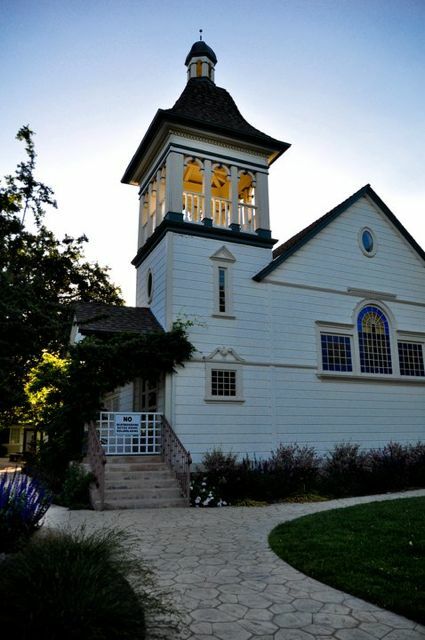 Recurrent these “Annals of the ‘parish’.” But the plucky town kept its back up, and when Mr. S.S. Smith of San Francisco, generously contributed $500 toward building a chapel, Nordhoff immediately made up the difference and never rested till the last coat of paint was on the walls and a sonorous bell in the steeple [this second church was built where the Ojai Library is now located in downtown Ojai]. After this little blizzard the social atmosphere cleared up; Christian charity that for a time had not a leg to stand on, now threw away its crutches, and asserted its supremacy, softening men’s hearts and extending the right hand of fellowship. But never again will the valley enjoy the primitive simplicity of its earlier years, when it was a model community, realizing the dream of a Roussen or a Tolsten. Note: When Mr. and Mrs. Charles Nordhoff visited the Ojai Valley in 1881, Mrs.
But…. at the time that Mr. Montgomery owned the house, it was a small one-story wooden house, the next family, the Bakers, added the second story and all of the other rooms (the Bakers added another room with each new child). Is this not the same house Mr. Clausen originally had the mortuary in?